Hot Victorian Moustache Simulator Steampunk shooter The Order comes out this week continuing February's sudden surge in video game goodness. But it's not all there is. Are you planning to pick anything up? 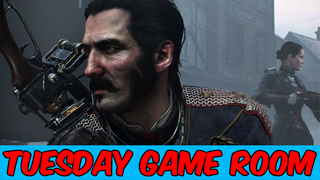 Come talk games and deliciously rendered facial hair in this week's Tuesday Game Room! I got my new 3DS last week, and I really like the system. Upgrading from the Original 3DS to the New XL was a big shock in terms of the sheer size of the thing, but the increased load speeds and snappier interface is more than welcome. I've not had the chance to test out a game that uses the new little c-stick nub thing - although Monster Hunter 4 Ultimate is on my list of things to pick up - but I have finally been able to play Smash Bros, having held off until the new console came out. It sure is Smash Bros. alright, which isn't a detriment - it's the same old heap of fun the series always has been to me (I'm not one who cares about competitive 'Smash', if you will - it's always been goofy fun with friends rather than a serious fighting game in my eyes). I've played with most of the cast at this point but as far as the characters I enjoy the most, I'm liking a lot of Robin, Marth and Lucina, and Fox, who was always my favourite in the past ones. But I'm also surprisingly enjoying the sword-wielding variant of the Mii fighter (as you can guess, I like sword people in these games), who is a lot of fun to tweak and customise. Smash bros. is still fun! The big game for this week, as mentioned up top, is The Order: 1886 on PS4 - but it's not all there is to the week! Dead or Alive 5: Last Round hits PS3, PS4, Xbox 360, and Xbox One, while Qbert Rebooted (I'm presuming it's now a gritty survival focused FPS) lands on PS3, PS4, and Vita. Total War: Attila comes to PC, while the PS4 gets a trio of downloadables: Hand of Fate, Paparazzi and Pillar. Finally, joining The Order on Friday is Kirby and the Rainbow Curse, the delectable claymation-style Kirby game, on Wii U. I quite like the symbolism of two radically different games graphically speaking, yet both equally visually incredible. Aesthetics, people! Turns out they matter. More details on Final Fantasy XV's 'Episode Duscae' - Square-Enix have opened up a little on the demo included with Type-0 HD, confirming that not only does it unlock day and date with the HD remaster's release (if you buy Type-0 at release, that is), but it contains several hours of gameplay within the unlocked region of Duscae, a supposedly teeny fragment of the full game. I'm a lot more excited about this than I have any right to be. Law & Order SVU tackles Gamergate as well as you'd expect - Another ripped from the headlines episode of SVU? I'm sure this will be handled delicately, said no one. Still, it's interesting that, as schlockily awful as SVU did it, that Gamergate's harassment of women in the games industry has gotten so prominent that even the most mainstream of cop shows did an episode on it. It was not a good week for Peter Molyneux - In a way, I feel sad for Peter Molyneux. He had a penchant for over egging his games to the press, but there isn't a bigger dreamer in the games industry than him, and that's admirable. But at the same time, as his most recent game Godus struggles to live up to both the usual Molyneux hype and actual kickstarter promises, it seems the world has gotten very tired of his overpromising schtick. It started off with this fascinating Eurogamer interview with Bryan Henderson, who won the chance to be the God of Godus after tapping the last brick of Molyneux's previous weird game Curiosity, damning in its own way, but it got worse very quickly with a savage, precise skewering of the man in an interview with Rock Paper Shotgun got so much attention Molyneux announced he would never talk to the press again. Oh dear. Asteroids is getting an open-world survival MMO reboot - VIDEO GAMES INDUSTRY. Nothing more needs to be said.